For most people, budgeting conjures up the same feelings as, say, prison and dieting. But your initial instinct couldn't be further from the truth. You just haven't budgeted the right way. You Need A Budget will teach you four simple rules to completely revolutionize the way you think about managing your money. 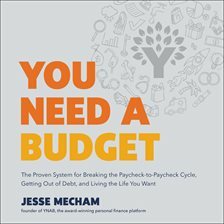 With a budget, you'll break the paycheck-to-paycheck cycle, get out of debt, and save more money. A liberating, enabling, empowering budget will actually make you feel more free, not more restricted. The YNAB philosophy is centered around these four rules: Give every dollar a job. Take your cash, checking, and saving accounts and assign jobs to that money. Begin now with what you have on hand. Then follow your plan. Pick your priorities, and make sure your dollars are helping you move closer to the things you care about most. Embrace your true expenses. Look ahead and identify the larger, less frequent expenses that tend to sneak up on you. Break those expenses into manageable monthly amounts. Consider insurance premiums, birthdays, holidays, charitable giving, car repairs, etc. This practice evens out your cash outflows, decreases your stress, and helps you make better decisions. Roll with the punches. Accept the fact that life always changes and you'll likely always go over budget somewhere. If an unexpected expense comes up and you need to change your budget, just change it. The YNAB philosophy not only tolerates changing your budget, but rather encourages it. Age your money. The goal of this rule is to increase the time between the moment you earn money, and the moment you spend that money. In other words, if you're going to break the paycheck-to-paycheck cycle, you need to learn to live on money you earned a month or two months or even three months ago. YNABs four rules are the pillars of a tried-and-true system that gets you to engage with your money every day. It helps you change your behavior so that you're proactive and in control of your finances. It's not about stressing over last month's statement; instead, you're looking ahead and actively deciding how you want-and need to build a life of meaning not stress.